Hiya folks, I didn't forget to post, only that I lacked time! This month, it has been CRAZY, with the holidays and all, but I didn't think it would have prevented me from blogging for such a long time. Here's the pic, as promised! I received an order for logoed cookies once again this year... but I encountered a hiccup. I haven't been using my edible ink printer since last Christmas, so the ink dried up on me! Looking at the cartridges, it appeared full but I guess it was just dried up colour. Lesson learned: to extend life of ink, remove from printer when not in use and seal it with plastic wrap then in a resealable container. I ended up having to pipe it all by hand but Sean (the client) was happy with it. I consider this treat my signature dessert. 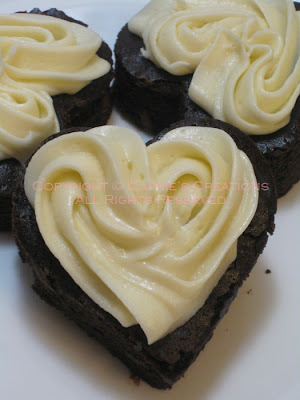 I baked these for a United Way bake sale at work, and also for my Christmas potluck as favours. 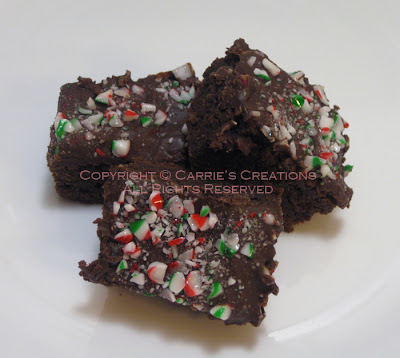 What I did different this year was melted milk chocolate chips with mint chocolate chips to spread on top of the brownie and I decided to "garnish" the brownies with crushed candy canes for a holiday touch. Gingerbread is King during Christmas time. During a work vendor sale, where it benefited United Way, I reduced my prices for sugar cookies and gingerbread cookies. 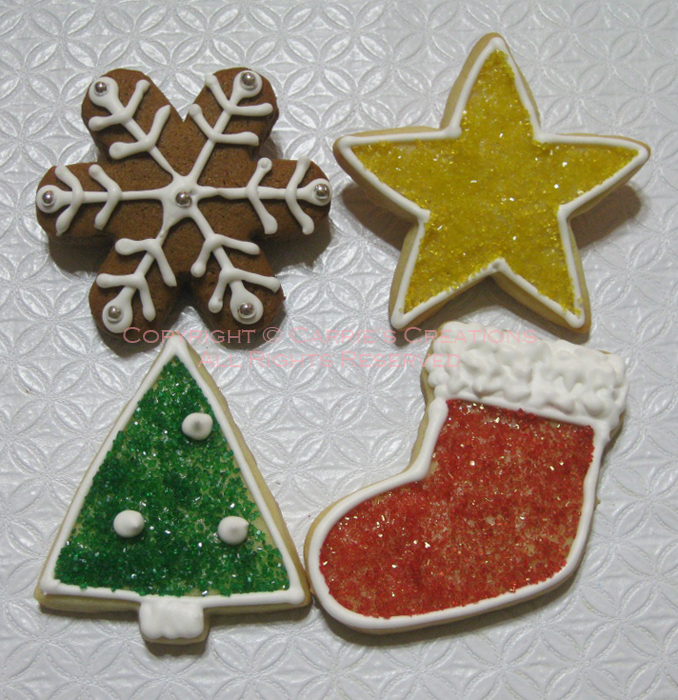 I wasn't going to offer gingerbread, but a colleague suggested that I add it to my sale, since it's very Christmassy. I pre-sold 5 dozen of each kind and all were redeemed before Christmas (cookies are great to give away or shared at home). A few people said that the cookies were thoroughly enjoyed (albeit too quickly) when they were served. Another blast from the past! Little Mikayla, who turned 5, wanted this cake ever since her mom showed it to her when I first made it. 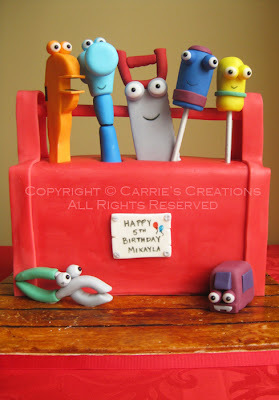 It's funny how she still loves Handy Mandy and didn't change her mind on what her birthday cake would look like when the date loomed closer. To please most of the guests, the cake was vanilla with vanilla Swiss meringue buttercream (SMBC). There are a few changes to the design, so it's not the exact replica of the original. Originally, these were supposed to be baseball sugar cookies. 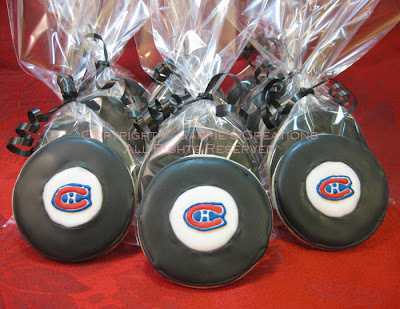 But the time frame was too short, and I was requested to make Montreal Canadiens logoed hockey pucks, instead, for a later date. 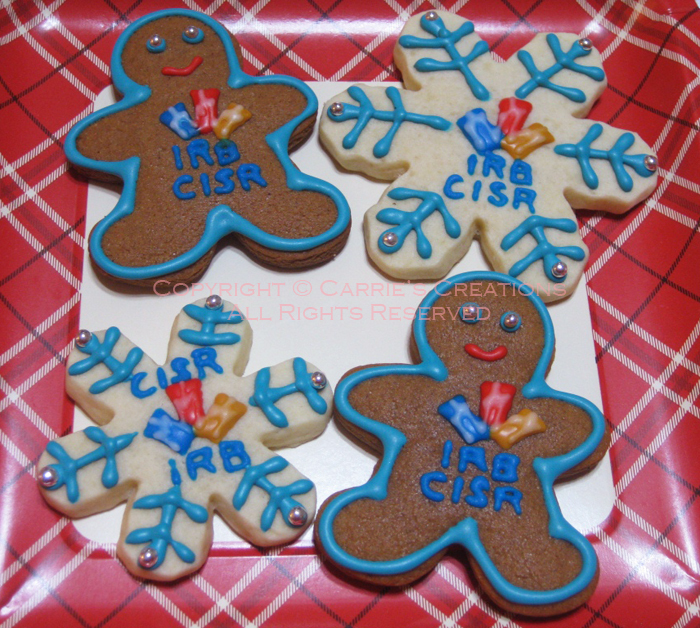 I made royal icing transfers of the logos, which was way easier than piping it directly onto the cookie. It felt weird making hockey cookies when there wasn't a hockey season this year... but it felt weirder, maybe even blasphemous, that I was making logos of the rivals of the Toronto Maple Leafs (James, my husband, is [unfortunately] a fan). 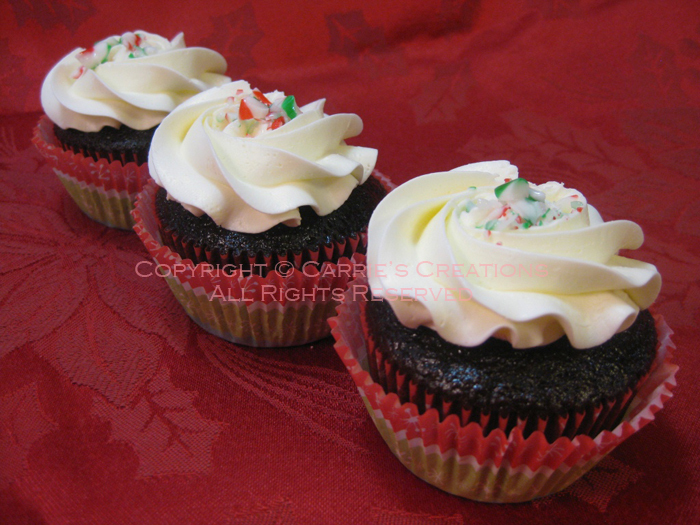 This was also a Christmas party/dinner order... the last one for me this year. I was told not to make it fancy, so I made my chocolate cake with vanilla SMBC. I couldn't leave the top go untouched... I decided to add of touch of festive with crushed candy canes. I was told that they were enjoyed by all. No pic of the bread pudding I made with panettone. 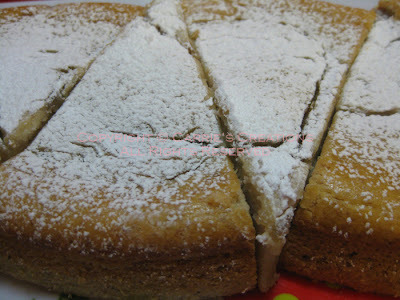 It was the first time I made it, so I baked it longer than the instructed time. In my defense, I was worried that it didn't set, and I would hate for guests to become sick from uncooked eggs. I could not believe how much cream and eggs were required. You do not want to know! For my dear step-brother-in-law. We are having a Christmas brunch, belatedly, and I wanted to bring something that most would enjoy. I reduced the sugar because I added an extra banana, but I think maybe I should have also put in more rice flour because it didn't set as hard as I'd like (even thought it was in the oven for over an hour). Still, it was tasty and not overly-sweet. I would make this again. That's it! Have a great time up to the new year, then an even better 2013!